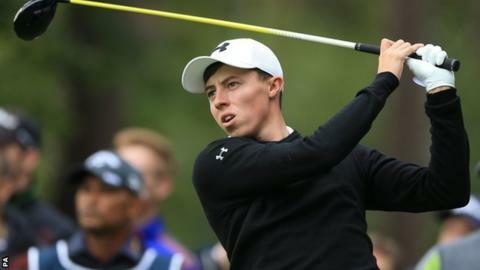 Matthew Fitzpatrick captured his maiden European Tour title with a two-stroke win in the British Masters at Woburn. The 21-year-old was tied for the lead going into the final day but Soren Kjeldsen and Fabrizio Zanotti picked up three shots to lead by two at halfway. But Sheffield's Fitzpatrick had four birdies in seven holes on the back nine in his 68 to post a 15 under total. Former world number one Luke Donald got to within one of the lead but finished four shots adrift in a share of fifth. World number 111 Fitzpatrick, who won the 2013 US Amateur Championship, was level par for the day when he pitched to five feet for a birdie at the 11th. At the par four 12th, playing partner Kiradech Aphibarnrat - with whom the Englishman shared the lead after the third round - found the water in trying to drive the green. The Thai would drop four shots in three holes and eventually finished in the tie for fifth. Fitzpatrick elected to lay up in the fairway and then played a majestic approach, which spun back to two feet to set up a second successive birdie. Following a crucial eight foot putt for par at the 14th, Fitzpatrick moved ahead with a superb 20-foot downhill birdie putt at the next and the advantage became two shots when Kjeldsen bogeyed the 16th after his drive finished behind a tree. The young Englishman, who only turned professional last year, consolidated his position with a superb iron shot to four feet for another birdie at the par three 17th and could afford to drop a shot at the last after his approach found a greenside bunker. He eclipsed compatriot Justin Rose to become the youngest winner of the tournament, which returned to the tour schedule after a seven-year absence. "The fans were incredible and I can't thank them enough," Fitzpatrick said. "My family have been incredible, I can never thank them enough." Fitzpatrick had been at the top of the leaderboard since an opening day 64 and his victory earns him exemption on the European Tour until the end of 2017. It also put him top of the fledgling points table for next September's European Ryder Cup team and he admitted: "I would love to be a part of that team. I was speaking to (captain) Darren (Clarke) the day before yesterday about it and he said, 'you just need to get a little bit more money on the order of merit'. "I might have to send him a text later saying, 'I'm trying'."